Orange County Mayor Teresa Jacobs joined leaders from the modeling, simulation and training (MS&T) industry at the National Center for Simulation (NCS) Hall of Fame induction ceremony held at the Orange County Convention Center on May 12. The NCS Hall of Fame is located at the Orange County Convention Center and showcases Central Florida’s flourishing MS&T sector to the 1.3 million guests who visit the Center annually. The MS&T sector contributes more than $4.8 billion to Florida’s gross state product and directly employs more than 27,000 Floridians with an average annual salary of almost $70,000. This year, the NCS posthumously honored American war hero U.S. Army LTC Earle Denton, who passed away in March. As a Purple Heart recipient, LTC Denton dedicated more than 25 years of his life to military service. He was a committed advocate for the new Orlando VA Medical Center and served on several Advisory Boards for Orange County including the Veterans Advisory Council, Planning and Zoning and Charter Review. In 2012, LTC Denton was named Orange County’s District 3 Citizen of the Year. That same year, Mayor Jacobs presented LTC Denton with the Joe W. Kittinger Medal of Achievement, the highest honor Orange County Government can bestow upon citizens who have exemplified greatness, courage and unwavering dedication to serving this great county. In February, he was awarded the Order of Saint Maurice from the U.S. Army at the National Center for Simulation. “Lt. Col. Denton is honored for his more than 40 years of leadership in the MS&T industry and for creating and implementing a comprehensive strategy directly responsible for the growth of the industry in Orlando, Florida, and the U.S.,” said retired Air Force Lt. Gen. Thomas Baptiste, president and CEO of the NCS. Other industry pioneers inducted into the NCS Hall of Fame include: the late Asmund S. Laerdal, who forged a new frontier in medical simulation with early inventions in CPR training and airway management; Henry C. “Hank” Okraski, a member of the U.S. Navy Senior Executive Service, whose lifetime of service created an industry that impacts nearly every aspect of military and civilian education and training; and retired Army Col. James E. Shiflett, whose vision and leadership culminated in the development of standards that changed training and simulation in the U.S. Army, Department of Defense and NATO partners. Orange County has a deep connection to the military through the region’s active duty and retired service men and women, and robust MS&T cluster. The region is home to 150 industry-related companies and the acquisition commands for the Army, Navy and Marine Corps; the Air Force Agency for Modeling and Simulation; plus 10 other federal government agencies and joint commands. The Central Florida Research Park, located next to the University of Central Florida, is the epicenter of the MS&T industry and fosters collaboration, cooperation and partnership between academia, industry and government. “Today’s technology and applications conceived and developed here in Central Florida satisfy the training requirements of virtually every specialty across all four military services,” Baptiste said. To protect this valued economic sector, Mayor Jacobs responded to looming threats posed by potential defense spending cuts and base closures by forming the MS&T Blue Ribbon Commission in 2013. The Commission is a coalition of community leaders and industry stakeholders that advocates for this high-value and high-wage economic sector in Florida. The commission continues to educate key audiences regarding the high level of synergy between MS&T and other key sectors of our economy, including medical, gaming, education, aviation, aerospace, animation, theme park, emergency management and public safety. Orange County Government supports the NCS, an industry association located in the Central Florida Research Park that links the defense industry, government, and academia on behalf of the entire MS&T community. Formed in 1993, its mission is to facilitate networking among its growing local, national, and international membership, potential partners and customers. 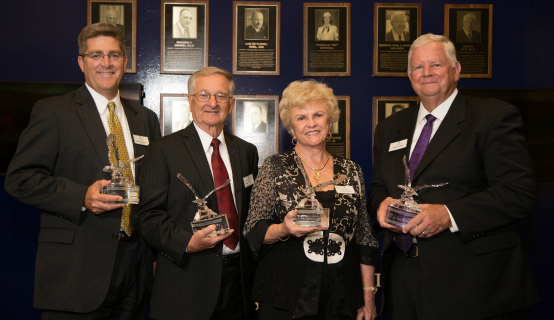 A collection of photos from the 2015 National Center for Simulation Hall of Fame Induction Ceremony are available on Flickr for use by the media.